This one had been on my radar since I first started getting into Bollywood soundtracks; for some reason it took forever to find. Three tracks (especially) makes it worthwhile: The infectious 'Aa Khelen Chhuppa-Chhuppi' (approx. 6:30 into the clip), 80s Bolly disco that for once has a proper, dance worthy, down and dirty groove; 'Aa Bahon Men Aa', more of the same only with more of a lounge feeling, enhanced by a couple of cool breaks, and the wonderful (but infuriatingly short) jazz funk instrumental 'Coda', rounding things off. 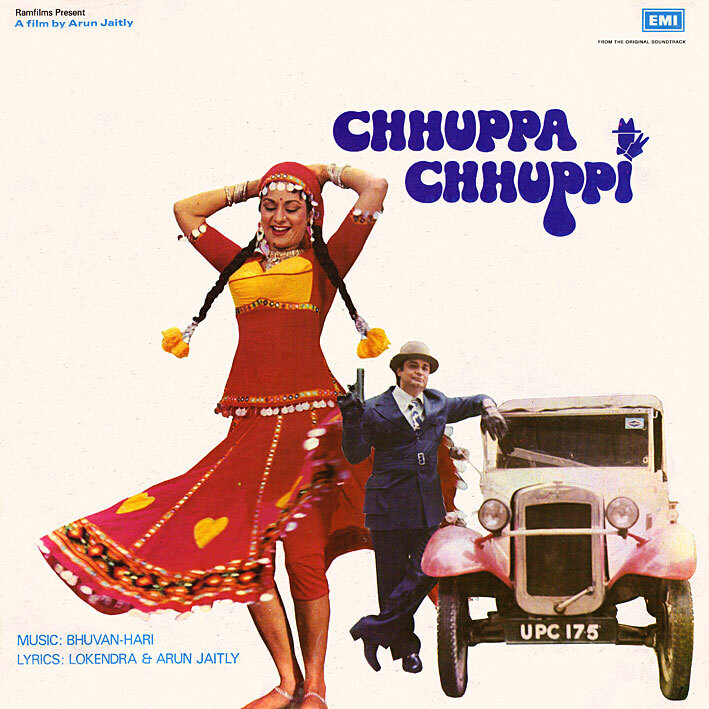 'Chhuppa Chhuppi' is another film that appears to be little known. It's not on the IMDb, and it took a lot of digging to find out anything about its music directors. Their full names are Bhubaneshwar Misra and Hariprasad Chaurasia, they seem to have been credited more often as Bhuban Hari, and they only scored a few films together. Hariprasad Chaurasia was later one half of another, slightly more prolific composing duo, Shiv Hari. Didn't you post this before? Coz if it wasn't you, where did i get my rip with front and rear scans from back in June 2009? Nope, not me. And surprised; didn't find any traces when I was googling it earlier. So good to see you back in action PC. I kept checking the website hoping you will be back at some point with something for all of us. litlgrey it was me who posted my personal vinyl rip on www.ourhfm.com in ,my thread "xice really rare film songs" thread.Again I have posted the same rip on my blog "www.xicecybervila.blogspot.com"
Excellent, mystery solved. And why have I not come across your blog earlier? It looks great. Thanks PC,I try to upload those vinyl rips which are not uploaded on your blog.In fact i love your blog too.I mailed you earlier to tag my blog site on yours.Don't know you got or not.Veen has tagged @ "http://mymusicmoviesandmutterings.blogspot.com"
Hm, might have missed it. I've linked to yours now though.